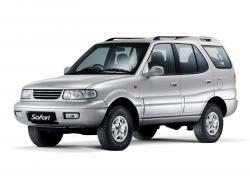 Correct Wheel Sizes, PCD, Offset, Rims and Tire specs for Tata Safari series. I need wheel lock nuts for my TATA Safari Dicor 2.2L 2011 model for extra safety of wheels. I need specification of nuts used in wheels so that I may procure from other companies making those by providing exact specs of wheel nuts. Pls help me.